Dave with a real nice pre spawn walleye from the Mississippi River. This fish struck hard on a jig and soft plastic tail. Head shook about eight times in the current and Dave's fishing pole was bouncing as it wouldn't budge for a while. It was going pretty darn good for a while we had many 20" plus fish and some of these larger ones as well. Dave is an avid angler and he talked about something that river fish have a lot more fight than your non river fish. I would agree. These fish did not want to move much and it helped greatly in fighting these fish to not put too much pressure on the fish until they started to come up. Even with practice fish can come off, I missed a nice one that I either " horsed" or wasn't hooked great..Nice fish Dave!! Wayne with the first bite and catch of the day! The condiitons were "just right" and we were fishing where the fish were and it was a great day had by all present in the boat. When your are fishing in the right place, where the fish are many techniques work. I advise people to do techniques that you are best at. I have many techniques I fish based on mainly water temperature and water clarity. Over the years, I have developed a system on fishing the conditions and letting the conditions dictate my techniques. Many times we have good success and sometimes its just a hard bite to figure out - thats fishing. Yesterday was one where my past experiences matched up with conditions that I understood to put me in the right places. A few of the bites were of the kind that if you took them too soon you'd end up with a big - WHIFF! - hookset. The fish to the right needed about three seconds and thats and eternity when jig fishing. Three seconds is nothing when Lindy Rigging. It is a situation where so many jig bites are the THUD or WHACK variety that man you just hammer them right away, so thats why I say it feels like an eternity. Dave with the last fish of the day! For the majority of the day we were able to fish by ourselves and not do the bumper boats. Nothing against fellow fisherman, but having a spot to yourself is a bonus that any angler understands. This fish was from a community hole though mixed in with a few eaters and a couple shorts it was a fun little spot to end the day on. Caught on a fathead minnow. April 16, 2019. I have been dying to get out and find fishable water to start doing business again. I arranged a trip with my friend to scout. Jeff landed the first three fish of the day in a perfect high-water spot that I fish in these conditions 14.5" walleye, another fish short eye, and then a keeper sauger between 18 to 19". A perfect start. He got this healthy mama eye soon after. Here is another jig fish that smoked the plastic bait. If you've read this site this time of year for any number of years you know that cold water IS soft plastic time. Especially when the bite is on. Great baits and fun to fish - anything with a tail will work - the colors are gawdy too that walleyes like!. I love bait, I do, but using plastics are pretty cool. Saugers on the river. Nothing like saugers a fun fish, a tasty fish, and they are prevalent. The Mississippi River is premier sauger water. Out of this ice chilly 36 degree water you can't tell the difference between an eye and a saug dog. So right now it is a extremely hard time to get on the water on the Mississippi River. I drove to a few launches to find fishable water today. The launches were closed, and closed, and not doable with my boat almost 20'... but I found a less used launch, launched had a ball caught the fish above and smaller ones too. Figured finally I can get my folks wanting to fish on the water..then I get a call on the water. To make a long story short, I was informed that the launch was closing. I got a call from the Sheriff saying the launch is closing soon and I need to move my truck. I told Jeff and he thought I was joking. So right now after this high high dirty cold water finally drops and water start to warm, I can't get the boat on the water. In fishing it is truly here today and gone tomorrow, and not only the fish BUT the LAUNCH. lol. all true. Just when you think you've found a great eater spot... "WHAPPP!" the rod tip pops - then its hair trigger hook set and the jig drives the well bit hook home. This fish was a beast of a fighter especially with the flow. Jeff and I saw this was a walleye very early in the battle, but if I wouldn't have seen it I would have swore it was a northern pike. I loosened my drag up and tightened it two whole cycles to land it. Very fun. Released of course. I didn't have to release it btw but why would you not? Let'm go to grow. Another chow down fish that will be released later this evening in Crisco Bay. Thanks to very low moisture for the last two weeks the river levels are finally dropping. I should be able to get the boat out next week and scout out Pool Four, and hopefully find fish! I have fished these high levels before over the last 20 years, and I can tell you a couple to a few feet lower helps greatly in finding fish. If you look on the graph, you can see the high spot is 682.87 feat above sea level. In the middle of winter the measurement is 668.0'. This high mark is nearly 15 feet high. This is very high water folks. Big logs come down stream and properties are flooded. This is a good time to garage fish and get your gear ship shape. The Mississippi River is a quality fishery in March and April. One benefit of fishing the very early spring is the big heavy walleye fight well. make sure to let the egg laden fish go. The river conditions right now on the Mississippi River are as you likely know, high and rising water. I personally have no trouble with high water for fishing in fact I like it. The main issue is the water temperatures are cold 33 degree cold. All the snow melted water flowing from the streams is ice cold and that is the inputs into the river. There are times that rain and a warmer earth provide warmer inputs. Right now that is not the case. The conditions of the rising water brings dirty water and that is a challenge as well. The bite is not the best right now. Good fishing will still come but it will take a little time. John with an 18″ sauger caught on a jigging rap. Jigging raps are a very versatile lure. ​and getting some keepers as well to keep things interesting. Active jigging techniques have been drawing in fish and catching them. Many times of the year saugers mix with the walleye and the ice season is one of them on the river. The St. Croix is a very good fishery and the only fish that is stocked is by the MNDNR is the Muskellunge. Natural reproduction keeps walleye population high. I will be guiding starting very soon on the open water. I am (like you) waiting for the sun and warmer weather to arrive. Really looking forward to getting out in the boat again! John with a dandy walleye. This fish hit with a thump! John gets so excited and kept yelling “He slammed it! its a big one… it’s a PIGGG! ” You’ve got to love that kind of enthusiasm – at least i do, so I ran over to the hole and helped pull this one out of the hole. I lost a big one earlier so helping each other get the fish out is a good move. Not a lot new to mention from the last report on this site. Especially since Pool 4 is not warm enough to fish from a guiding stand point for me. The St. Croix crappie bite remains steady as it goes from last report. if you do any ice fishing right now in good walleye spots you will certainly tangle with these little gremlins. Some of the walleye are close to 8″ and some about 5″, it is fascinating to me that there can be such a growth difference. In the picture above I added the clear plastic container filled with fish heads that are frozen ahead of time and cut off with a razor blade. I then just open up this ” tin” of minnow heads so the fish can have a chew. This works as good as live heads as far as I can tell. Plus it is a lot less weight than carrying around a container of water. I like to ice fish many holes and hop around a lot and not having minnow water is nice to not consider or drag around in the shelter and get everything wet. The rear drag reel has the knob to adjust the drag under the reel. This makes the actual drag loosening possible. I will debate anyone that says the top drag is better. In saltwater sure or salmon fishing where they spool you – ok you’re probably right. Not in freshwater with the fish we see. The reason the rear drag went away about 20 years ago is the word got out it “wasn’t as strong” so then the top drag was sold to a degree it is 97% of the offered products being a top drag spinning reel. Walleye won’t fry your drag or a pike either. Plus you don’t want the line to stretch on hook set especially stretchy mono. So set the drag to not give and set the hook firm! If its a good one turn the rear knob five clicks counter clock wise and let the fish run. Highly doable this way. Here is a bigger sauger from before the snow. Look closely at the reel it is a rear drag. Having some success on the few trips I’ve had personally on the St. Croix River for ice fishing. 16″ sauger came up fast from the first group of holes I drilled and crushed the lure. are reporting decent results. The anglers are not getting them fast and furious but at a steady pace. Crappie minnows below bobbers are doing a lot of the catching. Anglers are getting some smaller sized walleye actively jigging, but the by product of the jigging is bringing in crappie to the deadstick bobber rods. Walleye are near the shoreline breaks and the crappie are more likely to be spread across the basin, you can get crappies and white bass close to shore though too. As mentioned here before on the WI side you can have three lines and that helps the catch, but reduces mobility. Depths in 32 to 36 is the basin and there are holes in the 40s. Max depth is 45′ and 42′ is deep on the Croix. Pool Four Red Wing during this warmer weather walleye and sauger have been slow and anglers are not reporting much at all for the bite. In less than a month, there is historically a warm stretch in February, I have found a decent walleye bite on Pool Four during this time. This will be the next stretch of my guiding coming up in February. Looking forward to it! that eroded some of the ice that had formed. Driving on the ice has been delayed based on this warm weather. The St. Croix sees most anglers fishing for crappies in the Bayport area. Here it is a deepwater basin bite. Fish can suspended easily 12 feet off of the bottom and can be hard to decipher at times from the abundant shad baitfish. The crappies roam the entire area. Deadstick minnows is often best versus active jigging. Fishing the bottom accounts for most fish despite the nature of crappie to suspend. The crappie bite can be quality size though many anglers struggle with numbers of these fish. Though white bass come in handy for good sport and table fair. January especially when it gets cold with clear blue skies finds a tough bite on the river, low pressure with clouds is better for action. Morning also seem good compared to midday. Night anglers report some good catches too. On the WI side of this Minnesota border water some anglers do well with a three hole set up drilled cross current they vertical jig the middle hole and bobber watch the others. NOTE – even when trucks drive on the frozen river there are always three open water areas that must be known. Pool 4 of the Mississippi River, this is openwater boat fishing for walleye and sauger all winter! During winter much of the fishing is vertical jigging and the water is clear and depths in 22 to 28 produce with both jig and minnow and jig and plastic. Use a smaller plastic in the height of winter. 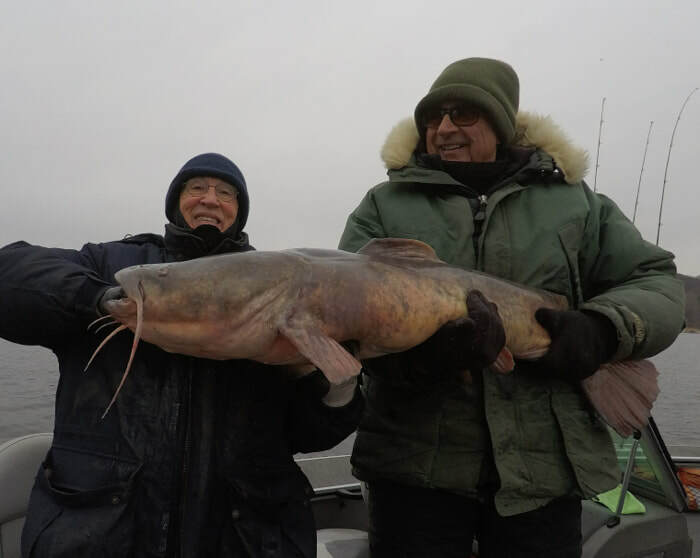 Boat fishing is weather dependent and temps far below zero do not allow fishing. For vertical jigging I use mono 6-pound test and medium light Limit Creek Rods. Believe it or not cranks also do well on three way set ups. The crankbait of choice here are small floating Rapalas. Troll slowwww in the deeper troughs. This bite is weather related and it is best accomplished when you have a warming trend in winter. Because of the clear water overcast days are better. Of the fish you catch 95% will be a walleye or a sauger this time of year, all the other species really slow down. When the bite is on it is very good fishing. Walleye need to be 15” minimum and saugers have no size restriction to keep. The St. Croix is all frozen over folks. Here are some picks from my last outing. The season ended well with Wayne’s group. You are correct to believe that is a BIG fish. Any fish needing two men to hold for the photot is big! Dave, on the left, caught it, his pal Wayne is doing the heavy lifting.. This was one of the biggest Flathead Catfish that I’ve seen!! 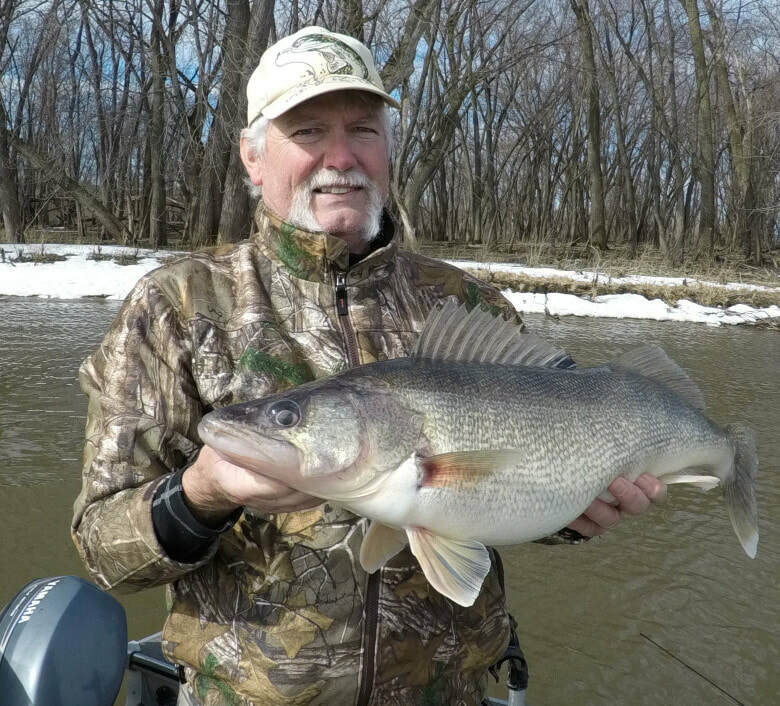 Here’s Wayne with a very nice late Fall walleye from the river.